The Montblanc Limited Edition Joseph II honours a revolutionary monarch and one of the greatest supporters of W.A. Mozart. With delicate features of the royal crest ornaments, the fascinating writing instrument presents a truly royal tribute to the namesake of this edition. Born as the first son of Empress Maria Theresa and German Emperor Francis I, Joseph grew up with his sister Marie Antoinette and his other siblings in Vienna, Austria. In 1764, Joseph II acceded to the throne, becoming King of the Romans (King in Germany) and only one year later the Emperor of the Roman Empire. In contrast to his mother, who still insisted on the old reforms, Joseph was already a proponent of enlightened ideas. Under his reign, he started a complete reform of the legal system. In this respect he abolished brutal punishment and the death penalty in most instances and imposed the principle of complete equality of treatment for all offenders. He ended censorship of the press and theatre. With his enlightenment policy, Joseph II implemented extensive cultural reforms whereby the cultural city of Vienna was in revival. As an avid music lover, the monarch was especially fascinated by piano concerts of an aspiring artist: Wolfgang Amadeus Mozart and opened the way for Mozart to become one of the greatest composers in music history. 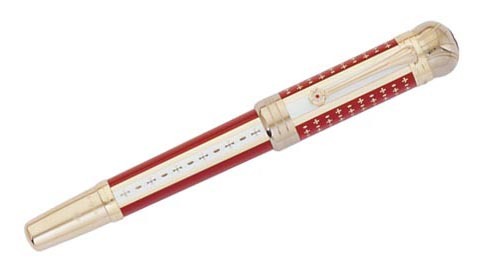 The red and white lacquer of the Limited Edition 4810 is reminiscent of the national colours of Austria. Its design is inspired by the imperial coat of arms of the monarch, inscribed on the 18 kt champagne gold nib as a delicate engraving. The champagne gold plated fittings on the cap and barrel complete this edition, dedicated to one of the greatest supporters of Mozart. All these unique features of finest craftsmanship make this edition a true homage to Joseph II, one of the most important patron of arts of his time.